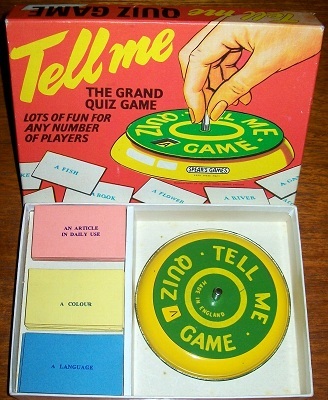 'TELL ME: THE GRAND QUIZ GAME' GAME: A jolly party game for young and old alike. Instructive, humorous and altogether enjoyable. This game is in excellent condition. The colourful box is solid and presents itself without tears or bending of any kind. The metal spinner works flawlessly and every card is in immaculate condition.